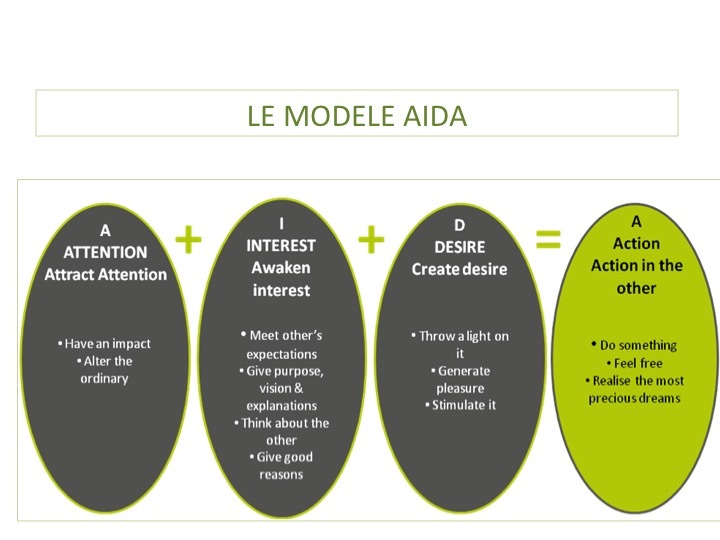 The AIDA model is an approach used by advertisers to describe the different phases of consumer engagement with an advertisement. It proposes a path with four phases, starting with the ability to attract the Awareness of consumers, then the ability to raise their Interest, then awakening their Desire for the product, which leads the consumers to take Action like purchasing the product or service. In view of recent research on impact and leadership, we kept the first three instances of this model and turned them into a precious tool. A tool that allows us to improve our communication and behavior with others, be it our hierarchical teams or colleagues. It is important to note that these three instances are not chronological but required simultaneously when facing others. It is crucial to know your target audience, their culture, socio-economic lifestyle in order to positively attract their attention. You must avoid whatever might be radical or shocking for them. Highlighting your difference often boils down to being confident in your capacities, relational skills, in being creative whilst being an approachable, agreeable person, open to others. Raising Interest requires being concerned of what interests your audience: what are their real issues? It’s about actively listening to what they say, or paying genuine interest in what they do. At some level, you will need to reconcile their interests and yours. This is a difficult, yet necessary, task. Your speech and deeds will stem from this reconciliation. Working together lies on a mutual trust, based on the respect of a set of common rules, aiming at reconciling personal and collective interests. AIDA makes us ask the question of colliding interests, and the construction of a collective set of skills necessary in enterprises. This construction is only possible if each one knows what they have to do, how to do but also why to do it. The “why” is key, because it provides meaning… and is very often missing! Do not forget it. Awakening Desire is not easy. We tried so hard to rationalize work in the professional context, that we simply forgot about our desire. Without desire, any action becomes « forced », therefore tasteless, sad and boring. Desire instigates creativity: it allows us to be alive relative to the undertaken action. When we talk about desire, we can also talk about emotions, that are not rational either. Simply said, we are not machines. Our heart, emotions and feelings are key drivers in instigating actions. When we want to drive someone’s action, well-constructed arguments are not enough. It is necessary to touch others deep in their hearts. Our behavior, attitudes, verbal and non-verbal communication certainly have consequences on the other person’s desire. If they are touched by our desire, there is no doubt we will be more at ease, persuasive and passionate. Our words, actions and language will be coherent. Conversely, our lack of desire can certainly not generate desire in others. The AIDA model helps us achieve Higher Impact®. But watch out! Attracting Awareness, raising Interest and awakening Desire differ from imposing one’s ideas by all means and at any cost. It is not about « forcing buy-ins », otherwise, they can be short-lived! It is about ensuring long-term buy-in for a project or decision. Furthermore, this buy-in must be freely agreed by others, based on both their reason and desire. Having a clear intention enables us to be transparent with others, and express our well-defined expectations when needed. For instance, the more transparent we are with employees about our expectations, the more purpose we provide them with, the more they can meet them. The AIDA model enables us to grow in higher impact, because it is a model outwardly turned towards others. It is about ensuring others’ primacy and converging our interests with theirs.